It will be the first non-football match to be played at the 60,260-capacity stadium, which opened in 2006. The women's and wheelchair events will be run alongside the men's competition for the first time. Newcastle's St James' Park will host the opening ceremony on 23 October with the men's and women's finals both at Old Trafford on 27 November 2021. All the venues were announced live on the BBC Sport website, with traditional rugby league strongholds such as the north west, West Yorkshire and Hull chosen. But Liverpool's Anfield home and Sheffield United's Bramall Lane ground are among other football stadiums included in the list, along with the Ricoh Arena, which is used by Wasps rugby union team and Coventry City FC. Notably the DW Stadium, home of current Super League champions and the game's most successful club Wigan Warriors, will not host any matches. Wigan MP Lisa Nandy said on Twitter that she was "shocked and deeply disappointed" that the venue and town were "snubbed" by organisers. She added: "As a leader in the sport and home to one of the best teams in the world, it's an inexplicable decision." At the previous World Cup hosted in Britain in 2013, England's quarter-final win over France was played at Wigan - a match watched by a crowd of 22,276. Wigan Council leader David Molyneux said that while "thrilled" that Leigh - a town in the Borough of Wigan - will host World Cup matches, he was "extremely disappointed" that Wigan had missed out. "I can't understand why Wigan, the home to one of the most famous teams in the world, was not given any games to host throughout the tournament," he said. "I'm sure this feeling is shared among fellow Wigan residents, however, we will of course support Leigh's fantastic achievement proudly and look forward to the games." Where will the Rugby League World Cup be held? Australia are the defending men's and women's champions, the men beating England 6-0 and the women edging out New Zealand 23-16 in the 2017 finals on home soil. The Emirates Stadium's gain is Wembley's loss as the national stadium has been overlooked. "We've got a marquee event and we wanted an iconic stadium to stage it in," said John Dutton, chief executive of the 2021 tournament. "We think Emirates Stadium delivers that in a central, great location that's easily accessible and just a great stadium that's never had anything other than football played in it - and we will break that." The Emirates will host one of the two semi-finals, but just two of the 31 matches in the entire tournament will take place south of Sheffield. 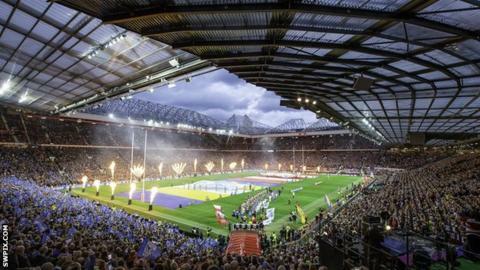 Elland Road in Leeds will stage the other semi-final, while Old Trafford will again host the final after drawing a crowd of 74,468 in 2013 for the match between Australia and New Zealand. Middlesbrough's Riverside Stadium is something of a surprise choice, while organisers will take three matches to a purpose-built 8,000-capacity stadium in Workington. The stadium, to be developed by Allerdale Borough Council, is expected to be completed by the spring of 2021 at a cost of £15m and will be the new home for both League One club Workington and the town's football team. England (hosts), Australia (holders), Fiji, France, Jamaica, Lebanon, New Zealand, Papua New Guinea, Samoa, Tonga, Wales, plus four other European teams (from Greece, Ireland, Italy, Norway, Russia and Scotland) and one other qualifier from Cook Islands, South Africa and USA.